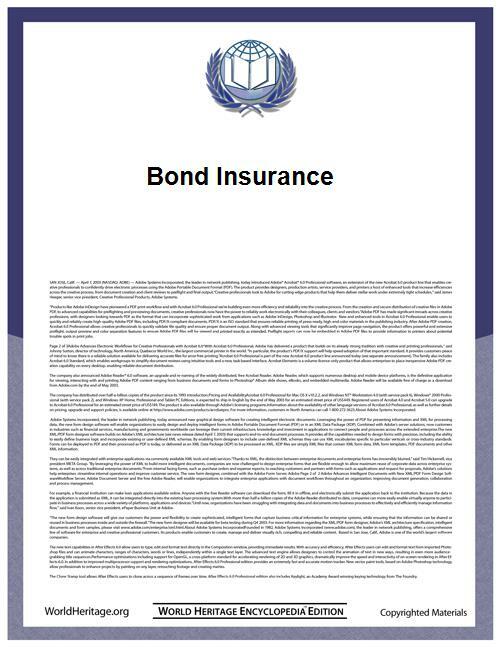 Bond insurance (also known as "financial guarantee insurance") is a type of insurance whereby an insurance company guarantees scheduled payments of interest and principal on a bond or other security in the event of a payment default by the issuer of the bond or security. As compensation for its insurance, the insurer is paid a premium (as a lump sum or in installments) by the issuer or owner of the security to be insured. Bond insurance is a form of "credit enhancement" that generally results in the rating of the insured security being the higher of (i) the claims-paying rating of the insurer and (ii) the rating the bond would have absent insurance (also known as the “underlying” or “shadow” rating). The economic value of bond insurance to the governmental unit, agency, or other issuer offering bonds or other securities is a saving in interest costs reflecting the difference in yield payable on an insured bond from that on the same bond if uninsured. The economic value of bond insurance to the investor purchasing or holding insured securities is based upon (i) the additional payment source provided by the insurer if the issuer fails to pay principal or interest when due (which reduces the probability of a missed payment to the joint probability that both the issuer and insurer default), (ii) rating downgrade protection so long as the insurer is more highly rated than the issuer, (iii) improved liquidity, and (iv) services provided by the insurer such as credit underwriting, due diligence, negotiation of terms, surveillance, and remediation. Bond insurers generally insure only securities that have underlying or shadow ratings in the investment grade category, with unenhanced ratings ranging from “triple-B” to “triple-A.”  Beginning in the 1970s, municipal government bonds were insured by bond insurers, also known as the “monolines.” The global financial crisis of 2008 seriously harmed their business model, to the point where the continued operation of a number of bond insurers is in doubt. Bond insurers are sometimes also referred to as "financial guaranty insurance companies" or "financial guarantors." Companies whose sole line of business is providing a particular type of insurance, in this case bond insurance, are called monoline insurers. Note that the insurance term “monoline” means only that these companies do not have other insurance lines, such as life or property/casualty. It does not mean they operate only in one securities market, such as municipal bonds, as the term is sometimes misconstrued. Bonds insured by these companies are sometimes said to be "wrapped" by the insurer. Municipal bond insurance was introduced in the U.S. in 1971 by American Municipal Bond Assurance Corp. (subsequently renamed AMBAC and later "Ambac"), the first of the financial guaranty corporations, being a separately capitalized insurance company formed for the purpose of insuring bonds. Ambac was joined in 1973 by Municipal Bond Insurance Association (subsequently renamed “MBIA”), Financial Guaranty Insurance Company (“FGIC”) in 1983, and Financial Security Assurance Inc. (“FSA,” now known as Assured Guaranty Municipal) in 1985. These became known as the “big four” bond insurers. Other participants in this sector included Capital Markets Assurance Corp. (nicknamed “CapMac”) (1988) and Bond Investors Guaranty Insurance Company (“BIG”) (1985), both subsequently acquired by MBIA; Capital Guaranty Corp. (1986), subsequently acquired by FSA; and College Construction Loan Insurance Corporation (nicknamed “Connie Lee”) (1987), subsequently acquired by Ambac. FSA, which was the first bond insurer organized to insure non-municipal bonds, established the business of insuring asset-backed securities (“ABS”). The 1980s also saw the birth of monoline financial guaranty reinsurance companies, including Enhance Reinsurance Company (“Enhance Re”) (1986) and Capital Reinsurance Company (1988). The 1990s then saw the combination of the municipal bond insurance business with the ABS insurance business, and also saw the expansion of bond insurance into Europe, Asia, Australia, and Latin America. In the late 1990s and early 2000s a new group of bond insurers emerged. These included ACA Financial Guaranty Corp. (1997); XL Capital Assurance Inc.("XLCA") (2000), initially a subsidiary of XL Capital Ltd. before being spun off in 2006 and subsequently renamed "Syncora Guarantee Inc."; and CIFG (2001). This era also saw the emergence of new reinsurers, such as Ram Reinsurance Company Ltd. ("Ram Re") and AXA Re Finance. In 1999, ACE Ltd. acquired Capital Re, and renamed the company “ACE Capital Re.” ACE Capital Re was spun off from ACE Ltd. in 2004 and renamed Assured Guaranty Corp. (“AGC”), which engaged in both financial guaranty insurance and reinsurance. In 2001, Radian Group Inc. acquired Enhance Reinsurance Company and its affiliate, Asset Guaranty Insurance Company, renaming the companies Radian Reinsurance Inc. and Radian Asset Assurance Inc., respectively. Both companies engaged in financial guaranty insurance and reinsurance. In June 2004, Radian Reinsurance and Radian Asset Assurance merged, with the surviving corporation being Radian Asset Assurance. The financial crisis that began in late 2007 negatively impacted the bond insurers and even threatened the continued existence of some industry members. Beginning in 2008, the financial guaranty insurers became subject to rating agency downgrades, largely as a result of their exposure to residential mortgage-backed securities (RMBS), either directly or through insurance of collateralized debt obligations of asset-based securities (so-called “CDOs of ABS”), which included CDOs backed by mezzanine RMBS. Insurers that guaranteed CDOs of ABS suffered the most extreme losses. In 2009, Assured Guaranty Corp.’s parent Assured Guaranty Ltd. (with its subsidiaries, “Assured Guaranty”), acquired FSA and subsequently renamed it Assured Guaranty Municipal (“AGM”), thus combining under the same ownership the two most highly rated bond insurers at that time (triple-A at the time of the acquisition, but downgraded to double-A in 2010). Also in 2009, MBIA separated its municipal bond insurance business from its other mostly asset-backed business, and formed "National Public Finance Guarantee Corp." (“National”) as an investment grade municipal bond insurer with the municipal bond insurance business that previously resided in MBIA. The separation transaction remains subject to litigation, pending resolution of which National has not written material business. Continuing the trend of reorganization in 2009, Ambac ceased writing business and was ultimately split into (i) a “segregated account” subject to a rehabilitation order by the Wisconsin Office of the Commissioner of Insurance (“OCI”) and (ii) a “general account” for ongoing operations, limited to municipal bond insurance. Ongoing litigation challenges the allocation of Ambac’s “asset-backed” and select other troubled business to its segregated account. By order of the New York State Insurance Department, FGIC ceased paying claims in 2010 and is in run-off. Syncora Guarantee Inc. (“Syncora”), CIFG, Radian Asset Assurance, and Ram Re remain solvent but are generally not writing new business. Bond insurance of residential mortgage-backed securities (RMBS) commenced in the 1980s but expanded at an accelerated pace in the 2000s, leading up to the 2008 financial crisis. As the housing bubble grew in the mid-2000s, bond insurers generally increased the collateral protection required for RMBS. However, both the bond insurers and the rating agencies that evaluated their credit did not anticipate the collapse of the real estate market that precipitated the financial crisis and the magnitude of the disruption to the residential mortgage market that accompanied the financial crisis. In addition, following the crisis, the bond insurers became aware that many RMBS they had insured included large percentages of loans that were ineligible for securitization and were subject to repurchase obligations by the RMBS sponsors who originated the securitizations based upon certain representations and warranties made by the sponsors of such loans. Unlike mortgage insurance, bond insurance generally provides for unconditional payment of claims, although the insurer reserves the right to pursue contractual or other available remedies. As a result, the bond insurers were faced with billions of dollars of claims to insured security holders associated with their exposure to RMBS following the financial crisis, with uncertain prospects for recoveries from the sponsors of the securitizations giving rise to those claims. One indication of the extent of loan quality misrepresentation was the settlement in 2011 between Assured Guaranty and Bank of America, which had purchased mortgage originator Countrywide. Under the terms of the settlement, Bank of America made a $1.1 billion payment to Assured Guaranty and agreed to cover 80% of up to $6.6 billion of Assured Guaranty’s future paid losses from breaches of representations and warranties on 21 insured RMBS transactions. While the widespread misrepresentation caused bond insurers to experience considerable losses on insured securities backed by residential mortgage loans (including first lien loans, second lien loans, and home equity lines of credit), the most severe losses were experienced by those monolines that insured CDOs backed by mezzanine RMBS. Although the bond insurers generally insured such CDOs at very high attachment points or collateral levels (with underlying ratings of triple-A), those bond insurers and the rating agencies failed to anticipate the correlation of performance of the underlying securities. Specifically, these bond insurers and rating agencies relied upon historical data that did not prove predictive of residential mortgage loan performance following the 2008 crisis, which witnessed the first-ever nationwide decline in housing prices. Notably, AGM and AGC did not insure such CDOs, which has allowed Assured Guaranty to continue its bond insurance business with strong credit ratings. Bond insurance generally reduces the borrowing costs for an issuer since investors are prepared to accept a lower interest rate in exchange for the credit enhancement provided by the bond insurance. The interest savings from the use of bond insurance are generally shared between the issuer (as its incentive to use the insurance) and the insurer (as its premium for providing the insurance). Since an issuer generally has the option of selling its securities with or without insurance, the issuer will generally only use insurance when doing so results in overall cost savings acceptable to the issuer. Municipal bond insurance premiums are generally paid up-front as a lump sum; while non-municipal bond insurance premiums are generally paid in periodic installments over time. In July 2008, the Association of Financial Guaranty Insurers (“AFGI”), the trade association of financial guaranty insurers and reinsurers, estimated that, since its inception in 1971, the bond insurance industry has saved municipal bond issuers $40 billion. In addition to credit enhancement, bond insurance provides other benefits to investors, including improved liquidity for the insured securities, surveillance of the underlying transactions, and remediation of the underlying transaction, should that prove necessary. Significantly, uninsured transactions are often not monitored by rating agencies following issuance of the initial ratings and, in the event of default, bond trustees often fail to take appropriate remedial actions absent direction and indemnity from the bondholders, which is typically not forthcoming. Until the 2008 financial crisis, the bond insurers suffered few material losses, with notable exceptions in the municipal sector including the losses experienced by Ambac in 1984 on its exposure to the Washington Public Power Supply System (WPPSS), which was the subject of an adverse court ruling (see The History of Bond Insurance, below), and by MBIA in 1998 on its exposure to Allegheny Health, Education and Research Foundation (AHERF), which declared bankruptcy. The purported benefit for the insurers was that they had very stable profits from a market that almost never defaulted. As publicbonds.org points out, a 1994 BusinessWeek article called MBIA “an almost perfect money machine.” The BusinessWeek story noted that up to 1994, MBIA had only one loss. Nonetheless, some have criticized the entire business model. In her book Confidence Game, Christine S Richard examines the basic assumptions upon which the industry was based. She argues that a monoline's business can be seen as, basically, selling a triple-A credit rating to a municipal bond issuer. However, the credit rating agencies had a separate “rating scale” applied to obligations of municipal issuers, as opposed to non-municipal issuers (e.g., corporations). Some argued that if the rating agencies had rated municipalities on the same scale they rated corporations, then the municipalities would have been rated much higher to begin with, and thus there was no real need for bond insurance. The question was debated before congress in 2008, at the House Committee on Financial Services under Barney Frank. Richard Blumenthal, then-attorney general of Connecticut, Ajit Jain of Berkshire Hathaway, then-Superintedent Eric Dinallo of the New York State Insurance Department, and a Moody's representative were also in attendance. Standard & Poor’s Ratings Services has denied that it employed or employs a separate rating scale for municipal and non-municipal issues. Moody’s Investors Service acknowledged that it employed separate rating scales for municipal and non-municipal issues, but has since adopted a uniform rating scale for all issues. Although penetration of insurance in the municipal bond market is far lower than when numerous triple-A insurers were active, the ability of Assured Guaranty to continue insuring municipal bonds at premium levels above historical averages is evidence that a market continues to exist for municipal bond insurance. Assured Guaranty insured 1,697 issues sold in 2010, with an aggregate par amount of $27 billion. Approximately 8.4% of the tax-exempt market was insured in 2010. The first monoline insurer, American Municipal Bond Assurance Corporation (now Ambac), was formed in 1971 as an insurer of municipal bonds. Municipal Bond Insurance Association (now MBIA) was formed in 1973. The companies sought to help municipalities and other public entities secure better access to cheaper funding. By 1980, about 2.5% of long-term municipal bonds were insured. As the number and size of insured bond issues grew, regulatory concern arose that bond defaults could adversely affect even a large multiline insurer's claims-paying ability. In 1975, New York City teetered on the edge of default during a steep recession. There was a risk that people who had bought New York City’s municipal bonds would not get their money back, but at the last minute a deal was made with the city's labor unions that prevented the default. In 1983, the Washington Public Power Supply System (WPPSS) defaulted on $2.25 billion of revenue bonds from two troubled nuclear power projects. Most of the 30,000 WPPSS bondholders lost between 60 and 90 cents on the dollar. On the other hand, holders of the small insured portion of the debt received full and timely payment on their bonds from Ambac, demonstrating the value of bond insurance to the market. This proved to be a watershed moment for the bond insurance industry, igniting steady growth in demand for many years. In 1989, New York State amended its insurance law by enacting a new Article 69, which established “financial guaranty insurance” as a separate line of insurance. Importantly, Article 69 (i) excluded financial guaranty insurers from coverage under the property/casualty insurers security fund (which covered payments by insolvent insurers); and (ii) limited financial guaranty insurers to writing bond insurance and closely related lines of insurance that include surety, credit, and residual-value insurance. Accordingly, Article 69 prevented property/ The monoline insurers thus took over the municipal bond insurance market. In 1995, the New York State Insurance Department (the “NYID”) enabled the monolines to write insurance on guaranteed investment contracts (“GICs”). GICs were envisioned as “stable,” highly rated investments sold by insurance companies, largely to pension funds in the 1970s and 1980s. With an insured GIC, the monoline would pay out in the event the original insurer failed. In 1999, the NYID issued guidance regarding insurance of obligations under credit default swaps, which facilitated the participation by financial guaranty insurers in the CDS market. The NYID guidance was subsequently codified by amendments to Article 69 of the New York Insurance Law. In the late 1990s and early 2000s, about 50% of bonds were insured. The 1990s saw continued expansion of the monolines into non-municipal and international sectors as U.S. domestic municipal bond insurance was becoming more of a “commodity.” See, for example, the 1994 BusinessWeek article on MBIA. AGM had been insuring RMBS since its inception as FSA, and experienced only minor losses in that sector before the 2008 financial crisis. AGM also insured the first collateralized debt obligation (“CDO”) in 1988. By 2008, the insurance of ABS – including RMBS, CDOs, and collateralized loan obligations (“CLOs”) – had grown into significant business sectors for bond insurers. Insurance of ABS took the form of financial guaranty policies and insured credit default swaps (“CDS"). By the early 2000s, the CDO market (especially the mortgage-backed CDO market) was growing significantly. The monolines became involved in more of these deals, typically by selling credit default swap (CDS) protection on the CDO tranches. This occurred at the same time that an increasing number of CDOs were being based on subprime mortgage debt. This business contributed to the monolines’ growth during this period, with the total amount of outstanding obligations insured by the monolines reaching $3.3 trillion in 2006. In 2006, this contingent liability was backed by approximately $47 billion of claims-paying resources, all in compliance with Article 69 and other states’ financial guaranty insurance statutes and with capital adequacy guidelines set by the rating agencies. Main article: 2007 subprime mortgage financial crisis. The year 2007 saw a crystallizing crisis in U.S. subprime mortgage-related bonds. The spillover into broader structured credit markets had a huge impact on bond insurers. When the housing market declined, defaults soared to record levels on subprime mortgages and innovative adjustable rate mortgages (ARM), such as interest-only, option-ARM, stated-income, and No Income No Asset (NINA) loans, all of which had been issued in anticipation of continuing appreciation in housing prices. Monoline insurers posted higher reserves for losses, as insured structured financings backed by residential mortgages appeared headed for default. On November 7, 2007, ACA, the only single-A rated insurer, reported a $1 billion loss, wiping out equity and resulting in negative net worth. On November 19, ACA noted in a 10-Q that if downgraded below single-A-minus, collateral would have to be posted to comply with standard insurance agreements, and that based on current fair values, the firm would not have the ability to post such collateral. On December 13, ACA's stock was delisted from the NYSE due to low market price and negative net worth, although ACA retained its single-A rating. Finally, on December 19, it was downgraded to triple-C by Standard & Poor’s. Downgrades of major triple-A monolines began in December 2007, resulting in downgrades of thousands of municipal bonds and structured financings. A full record of rating agency actions with respect to the monolines from July 2007 through June 2008 was prepared by AFGI in July 2008.
Credit default swap markets quoted rates for monoline default protection more typical for below-investment-grade credits. Structured credit issuance ceased, and many municipal bond issuers spurned bond insurance, as the market was no longer willing to pay the traditional premium for monoline-backed paper. New players such as Warren Buffett's Berkshire Hathaway Assurance entered the market. By January 2008, many municipal and institutional bonds were trading at prices as if they were uninsured, effectively discounting monoline insurance completely. The slow reaction of the ratings agencies in formalizing this situation echoed their slow downgrading of subprime mortgage debt a year earlier. Commentators such as investor David Einhorn  have criticized rating agencies for being slow to act and for giving the monolines undeserved ratings that allowed them to be paid to “bless” bonds with these ratings. Stock prices for the publicly traded monolines, such as Ambac and MBIA, fell dramatically. Ambac share prices climbed from the teens in the early 1990s to $96 by 2007. By mid-2008, Ambac shares were trading for around $1 – and by the end of 2010 at 10 to 13 cents per share. MBIA had a similar fate, climbing to the $60s by 2007, but falling to about $6 per share by 2009. In 2010, the Wisconsin insurance commissioner separated Ambac into a segregated account (with liability for asset-backed and infrastructure policies and certain other troubled policies) and a general account (with liability for most municipal policies). Ambac’s segregated account was placed under rehabilitation, with the plan to pay about 25 cents on the dollar to the “counterparties” that are owed. On November 8, 2010, Ambac’s holding company filed for Chapter 11 bankruptcy. As of September 2011, Assured Guaranty remains an active writer of bond insurance, insuring 10-13% of all municipal bond issues and a larger percentage of investment grade issues rated below double-A. National remains poised to reenter the municipal bond insurance market upon successful resolution of pending litigation. Radian Asset has acquired Municipal and Infrastructure Assurance Corporation (“MIAC”), a bond insurer formed but never launched by Macquarie Group, and may use this vehicle to reenter the sector. Other potential new entrants have been in discussions with rating agencies and regulators, although uncertainty surrounding rating agency requirements remains a key obstacle to entry. ^ Is Municipal Bond Insurance Dead? by Jeff Rose on August 14, 2009, Good Financial Cents, goodfinancialcents.com accessed 2010 4 15.